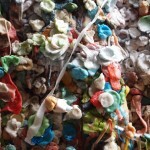 Possibly the grossest and most interactive attraction we’ve come across is Seattle’s Gum Wall. In a back alley below Seattle’s famous Pike Place Market, is a brick building that has been covered, and covered again, with chewed gum – Bubble Yum, Big Red, Juicy Fruit, Trident and Wrigley’s balled up, smeared, artistically aligned and placed confusingly high, low – everywhere you can imagine. As we explored the city, we each popped a piece of Orbit Spearmint gum and started chewing knowing our gum would find its final resting place as our addition to the famous gum wall. After finding it, we chewed one last time, pulled the gum from our mouth and gingerly stuck it to the wall trying hard not to touch any of the other pieces. Sure, it’s a germ-o-phobe’s nightmare, but it’s organic, in idea and material. Wonder what it does to the property value? Boy dad would have loved to seen that, maybe he could have put his own gum art there. LOL………….Remember dads gum papers he made? I’m always amazed at how you guys can find the most interesting places to visit! The stories will last for a lifetime!